All 65 SV-4B got a V-number. For information and pictures of an airplane just click on its V-number. Red ones are for sale. The following airplanes were used for glider towing : V4 - V6 - V43 - V46 - V49 - V62 (Centre de Vol à Voile/Gliding Center), V24 - V28 - V33 - V34 - V35 (Vol à Voile/Gliding 1, 7 and 10 Wing), V36 (Gliding Center Fontainebleau). Probably also V16 (1 Wing), V40, V42, V51, V53 (7 Wing) and V39, V45 (Chièvres) were also used for glider towing, but only occasionally. 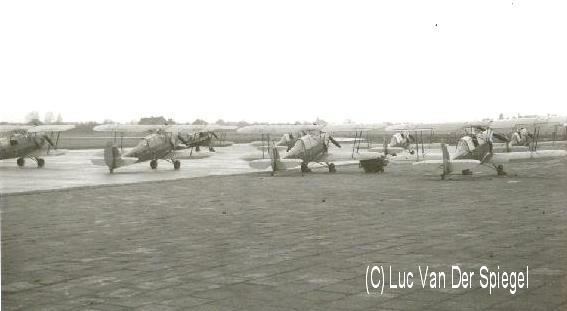 Database, history and gallery of the 65 airplanes that were used by the Belgian Air Force, and the still flying planes. Acro Team "Les Manchots" , the SV-4B airplanes they used, and the aces. Article of Dominique Hanson. SV-4B with Blackburn Cirrus engine article of L. Wittemans. Other types of SV airplanes and the LINK trainer , the other types of SV airplanes build bij Stampe Vertongen and an article about the LINK trainer, the first generation of flight simulators. SV-4B V2 trip to Kamina (Congo) , in 1950 military pilot Manu Geerts had to deliver SV-4B V2 in Congo, Kamina. A trip of 10.578km, and 66 hrs flying time, article of R. Decobeck. SV-4B in WWII in Africa , at the beginning of WWII 24 planes of the earlier SV-4B version airplanes, were transferred to Congo, at that time a Belgian Colony. This version had no closed canopy. An article of L. Wittemans. Belgian Air Cadets , they used for several years the last military SV-4B airplanes. SV links and other related links.